The Incarnation illustrated with scenes from the Old Testaments and the Gospels, with the Trinity in the central column, by Fridolin Leiber, 19th century. The noun incarnation derives from the ecclesiastical Latin verb incarno,[note 1] itself derived from the prefix in- and ''caro, "flesh", meaning "to make into flesh" or, in the passive, "to be made flesh". The verb incarno does not occur in the Latin Bible but the term is drawn from the Gospel of John "et Verbum caro factum est" "and the Word was made flesh" (John 1:14). Eventually, teaching of Alexander, Athanasius, and the other Nicene Fathers, that the Son was consubstantial and coeternal with the Father, were defined as orthodox dogma. All divergent beliefs were defined as heresies. This included Docetism, Arianism, and Sabellianism. The Incarnation implies three facts: (1) The Divine Person of Jesus Christ; (2) The Human Nature of Jesus Christ; (3) The Hypostatic Union of the Human with the Divine Nature in the Divine Person of Jesus Christ. Without diminishing his divinity, he added to it all that is involved in being human. In Christian belief it is understood that Jesus was at the same time both fully God and fully human, two persons in one nature. The body of Christ was therefore subject to all the bodily weaknesses to which human nature is universally subject; such are hunger (Matt.4:2), thirst (John 19:28), fatigue (John 4:6), pain, and death. They were the natural results of the human nature He assumed. In describing Servetus' theology of the Logos, Andrew Dibb (2005) comments: "In Genesis God reveals himself as the creator. In John he reveals that he created by means of the Word, or Logos, Finally, also in John, he shows that this Logos became flesh and 'dwelt among us'. Creation took place by the spoken word, for God said 'Let there be…' The spoken word of Genesis, the Logos of John, and the Christ, are all one and the same." In contrast to the traditional view of the Incarnation cited above, adherents of Oneness Pentecostalism believe in the doctrine of Oneness. Although both Oneness and traditional Christianity teach that God is a singular Spirit, Oneness adherents reject the idea that God is a Trinity of persons. Oneness doctrine teaches there is one God who manifests himself in different ways, as opposed to a Trinity, where God is seen as one being consisting of three distinct persons. To a Oneness Pentecostal, Jesus is seen as both fully divine and fully human. The term Father refers to God Himself, who caused the conception of the Son in Mary, thus becoming the father of the child she bore. The term Son refers to the body Jesus dwelt in, and the Holy Ghost refers to the manifestation of God's Spirit inside of and around His people. Thus the Father is not the Son — and this distinction is crucial — but is in the Son as the fullness of his divine nature. Traditional Trinitarians believe that the Son always existed as the eternal second person of the Trinity; Oneness adherents believe that the Son did not come into being until the Incarnation, when the one and only true God took on human flesh for the first, last and only time in history. Oneness doctrine is explained in detail in UPCI minister Dr. David K. Bernard's The Oneness of God. This conception differs from the traditional Christian Trinity in which only one of the three divine persons, God the Son, had an incarnated physical body, and Jehova has not. It also differs totally from the Jewish tradition of ethical monotheism in which Elohim (Hebrew: אֱלֹהִים‎‎) is a completely different conception. ↑ Lewis and Short "incarno -āvi, ātum, 1, v. a. in-caro, orig., I. to make flesh; hence, in pass. : in-carnārī , ātus, to be made flesh, become incarnate (eccl. Lat. ), Claud. Mam. Stat. An. 1, 12; Salv. adv. Avar. 3, 2; Cassiod. Hist. Eccl. 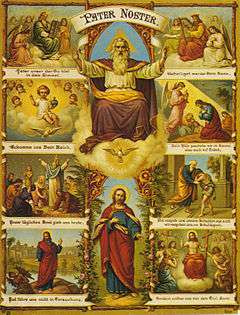 2, 9 al.,"
↑ The Seven Ecumenical Councils, from the Nicene and Post-Nicene Fathers, vols. 2-14 (CCEL.org) Contains detailed statements from each of these councils. The First Council of Nicaea, Council of Ephesus and Council of Chalcedon are the "First," "Third" and "Fourth" Ecumenical Councils, respectively.